Arrive in Siliguri at New Jalpaiguri Railway Station (68 km) / Bagdogra Airport (69 km) / Tenzing Norgay Bus Stand (62 km), met our tour representative. He would help you in taking an assisted transfer to Darjeeling. Home to the World Heritage Train- the Darjeeling Himalayan Railway (DHR) or the toy train, Darjeeling is an enchanting hill station. Lying at a height of 7100 feet above the sea level, Darjeeling has aromatic lush tea estates, tranquility in abundance, breathtaking scenery, Buddhist monasteries, bustling streets and several striking views. After you arrive in Darjeeling, check- into the hotel. You can relax for a while. The evening is at leisure and you can spend it as per your own liking. Have a leisure walk up to the Mall or visit the local shopping centers to get your hands on some memorabilia. Over Night stay at Darjeeling. Padmaja Naidu Himalayan Zoological Park- Known all around the globe, it is popular for its conservation breeding programs of Red Panda, Tibetan Wolf, Snow Leopards and other endangered animal species of the Eastern Himalaya. Take a walk in the sprawling Tea estates to soak-in the serenity and refreshing aroma. The sight of greenery spread all around looks quite soothing. The Cable car ride on Darjeeling Rope way offers spectacular views Rangeet Valley. The white colored Peace-pagoda is a huge dome-like structure is another attraction here that has golden-colored Buddha statues in varied postures. The day after breakfast is for a day’s trip to Mirik. Perched at an elevation of 1494 m above the sea level, Mirik is an off-beat destination that is becoming a popular tourist destination, near Darjeeling. The drive from Darjeeling to Mirik has a few scenic spots from where you can stop for photo opportunity. With Sumendu Lake in its mid-point, beautiful Mirik town is blessed with verdant tea gardens, landscaped gardens, cardamom groves and the mighty Himalayas. Spend the day here, indulging in activities like boating in Sumendu Lake and horse riding to explore the place. In the evening, back to Darjeeling. On your way back, taka a stoppage at Pashupati Market (on the India-Nepal Border). You can get your hands on antiques, souvenirs, foreign goods and other knick-knacks. in Darjeeling, the evening is free for visiting the Mall Road or the Local market area. Start your day with an early morning breakfast. 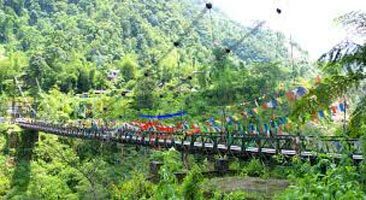 Check-out formalities, followed by transfer to Kalimpong. Placed at the foothills of the Himalayas, the lush destination of Kalimpong is located at an altitude of 1250 meters above the sea level.Leave the hotel room to begin sightseeing in Kalimpong including the popular attractions such as Forest Museum (Closed On Thursday), Deolo Hill, Hanuman Mandir - a Hindu temple with a huge statue of Lord Hanuman that is near Durga temple, Dr Graham Homes, Durpin Monastery, Mangal Dham - another beautiful tranquil temple complex in Kalimpong that has temples of Lord Krishna and Guru Mangal Das Ji, Pine View Nurseries (Cactus Only)located on Durpin hill (1372 m), Durpin Gompa boasts of being the largest monastery of Kalimpong, formally known as Zangtok Pelri Phodang. Dalai Lama, in the year 1976, had consecrated this monastery.There is a well-maintained park too. Pony rides are offered for kids. Today, have your breakfast and begin driving towards Gangtok, the capital city of the north-eastern state of Sikkim. Located at an elevation of 1600 meters above the sea level, the beautiful and peaceful hill town of Gangtok, is known to be one of the most popular tourist destinations of North-eastern region of the country. Its Buddhist monasteries, abundant lush scenery and pleasant climate allure honeymooners from all around. Hold hands in hands and admire the enchanting scenery of the town. Gangtok also houses a vast variety of butterflies, and colorful flowers like Orchids and Rhododendron. morning breakfast Visit to Directorate of Handicrafts & Handloom, Research Institute of Tibetology, Do Drul Chorten (Stupa), Enchey Monastery, White Hall, Flower Show, Ganesh Tok- a temple dedicated to Lord Ganesha, placed on a small hill on the Gangtok-Nathula Road, Hanuman Tok, Tashi View Point, Banjhakri Falls, one of the finest falls close to Gangtok, place amidst a lush green well-maintained Shamanistic- themed park. If you are a nature lover, do visit the permanent flower show held at the Flower Exhibition Center, another popular attraction. The floral exhibition site is near Ride Park and White Hall, and is a place where you must not miss clicking photographs. This exhibition area has a green house effect and consists of a vast variety of floral species such as celosia, gerberas, roses, orchids and more. During the night hours, you can visit the discotheques in Gangtok. Stay overnight. 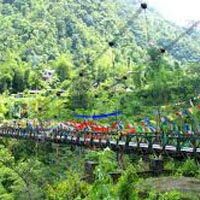 Day of the tour is for visiting the nearby attractions of Gangtok. The day is scheduled for excursion to Tsomgo Lake and Baba Mandir. Have your breakfast and leave for your trip. Tsomgo Lake or Changu Lake, lying at an elevation of 12,400 feet above the sea level is a glacial lake, which is 37 km away from Gangtok. This stunning attraction, it is frequently visited by Brahmin ducks and other colorful migratory birds. This oval-shaped lake is 50 feet deep and is covered with snow all round the year. Let your kids can yak rides; there are shops near the lake selling Yak cheese. On the banks of the Lake, there is a temple also, dedicate to Lord Shiva temple. Capture the beautiful scenery through your camera. After exploring the Lake site, continue towards the next attraction of the day Baba Harbhajan Singh Memorial War temple, around 20 km from here. Originally a war memorial, built in the memory of soldier Harbhajan Singh of the 23rd Punjab Regiment, who sacrificed his life in the Indo-China was of year 1962, it slowly turned into a temple. It was constructed in 1983 by the Indian Army after the deceased soldier appeared in the dream of his soldier friend. This temple made inside the bunker of the soldier and consists of his personal belongings like photographs. There is a wishing pond near the temple. Throw a coin in the pond and make a wish. In the evening, return to Gangtok. If time permits, you can visit the Mall Road or simply relax in your room. (Note- If there is landslide or we are not able to take you to Tsomgo Lake, there will be an alternate sightseeing). On the last day of the tour, after breakfast get on-time transfer to Siliguri -New Jalpaiguri Railway Station / Bagdogra Airport / Tenzing Norgay Bus Stand for your onward journey.